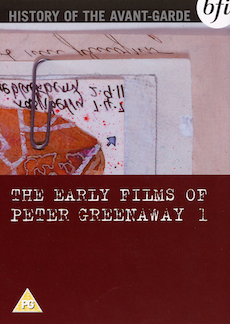 The BFI presents the definitive collection of Peter Greenaway's early works. The content of the six films on this volume varies widely – the potted history of 37 people who have fallen to their deaths from windows (Windows), a sequence of 92 maps to guide a dead ornithologist on his way into the afterlife (A Walk Through H) – but all the films are immensely playful and take pleasure in cataloguing the absurd. Composer Michael Nyman started his career with Peter Greenaway and contributes a thrilling score to A Walk Through H.
Filmed introductions by Peter Greenaway to each film. Galleries of artworks - contains material from 1968-1978. Archive notes for unmade projects.